We’d love your help. Let us know what’s wrong with this preview of Rome by Matthew Kneale. No city on earth has preserved its past as has Rome. Visitors stand on bridges that were crossed by Julius Caesar and Cicero, walk around temples visited by Roman emperors, and step into churches that have hardly changed since popes celebrated mass in them sixteen centuries ago. These architectural survivals are all the more remarkable considering the violent disasters that No city on earth has preserved its past as has Rome. Visitors stand on bridges that were crossed by Julius Caesar and Cicero, walk around temples visited by Roman emperors, and step into churches that have hardly changed since popes celebrated mass in them sixteen centuries ago. These architectural survivals are all the more remarkable considering the violent disasters that have struck the city. Afflicted by earthquakes, floods, fires and plagues, it has most of all been repeatedly ravaged by roving armies. Rome: A History in Seven Sackings examines the most important of these attacks and reveals, with fascinating insight, how they transformed the city - and not always for the worse. From the Gauls to the Nazis, Kneale vividly recounts those threatening the city, while drawing an intense and vibrant portrait of the city and its inhabitants, both before and after being attacked. In these troubled times when our cities can seem fragile, Rome's history offers a picture that is both shocking and also reassuring. Like the Neapolitans from Norman Lewis's Naples 44, Romans have repeatedly shrugged off catastrophes and made their city anew. To ask other readers questions about Rome, please sign up. HAs ROME BEEN TRANSLATEDOR PUBLISHED IN Italian? Constructed essentially as an anthology series of historical sackings, this is an ambitious attempt at writing the history of a city from its post-Roman origins without just a simple chronological narration. I think broadly speaking it works well and to Kneale's credit there is a lot of cross-referencing and comparative analysis of the different periods particularly in terms of demographics, economics, technology, food and architecture - all of which give a good sense of how we got to the presen Constructed essentially as an anthology series of historical sackings, this is an ambitious attempt at writing the history of a city from its post-Roman origins without just a simple chronological narration. I think broadly speaking it works well and to Kneale's credit there is a lot of cross-referencing and comparative analysis of the different periods particularly in terms of demographics, economics, technology, food and architecture - all of which give a good sense of how we got to the present day. Some chapters are more interesting and factually relevant to Rome as it is today than others. The sacking by Henry IV (1081), by the French under General Oudinot (1848) and the Germans during WW2 after Italy had surrendered (1943-45) are the standouts and unlike most books covering these events, Kneale writes from a uniquely Roman perspective. Useful for underscoring just what a brutal and often dark history belies such a great city (Garibaldi's attempted defence of the Republic in 1848 or the Ardeatine Massacre of 1944 being two examples within those chapters where the Italian perspective is much more valuable). Title pretty much says it all. It goes from the first sacking of Rome from the Gaulish invasion in 387 bce. Then the Goths in 410ce. The Spanish/Lutheran invasion, The French, The Nazis stand out in my mind. Describes the sackings and the state of the eternal city around the times of these successive invasions spanning nearly 2400 years. Author Matthew Kneale serves as a truly enthusiastic guide through the history of his adopted home city, Rome. With three thousand years to take you through, he faces an important problem: he needs to “choose his battles;” he truly stands no hope of both telling the whole history and keeping your interest. Rome’s been besieged many more than seven times, but that’s OK, the idea is not to tell you about s Author Matthew Kneale serves as a truly enthusiastic guide through the history of his adopted home city, Rome. With three thousand years to take you through, he faces an important problem: he needs to “choose his battles;” he truly stands no hope of both telling the whole history and keeping your interest. Rome’s been besieged many more than seven times, but that’s OK, the idea is not to tell you about sieges and sackings, it’s to impart some of Rome’s history on you, and hopefully some of the author’s love and admiration. To tell you about how people lived, how they were governed, what they wore, what and how Romans ate, what they drank, how often they bathed, where they lived, where their masters lived and how their society was structured. And then, of course, how the siege went, that’s in there too! The book would be incomplete without the careful reconstruction of the historical events and without portraits of the historical figures who turned Rome into a battlefield, which are all present and correct; the book is worth reading for the many intrigues alone. With one exception, his first six sieges are spaced out by 500 years from one another, to give the city time to grow (or shrink!) and evolve. This is not about the sieges, it’s about Rome, bottom line! So you start with Gaul Brennus, who ravaged Rome in 387BC after defeating its army at the battle of Alia, you move on to Visigoth Alaric, whose success on his third attempt in 410AD probably caused his death to malaria which he probably got in Rome the same year, and from him to the unsuccessful Ostrogoth Witigis who was thwarted by Belisarius in 538, only for his successor Totila to capture the eternal city two years later. Rome was at its filthiest, but also at its grandest (excluding classical times) when Matthew Kneale brings us back, to tell the story of the unfortunate Pope Clement VII (a lesser member of the Medici family), who was undone by Emperor Charles V of Spain and his Lutheran Landesknechte in 1527. This was a proper sacking, probably almost as bad as that by the Vandals in antiquity (which is not much documented and does not feature in the book). Also, this marks the last time in this book when Rome was actually an important city, geopolitically speaking. From there it’s to the 1848 defeat of Garibaldi and Mazzini at the hands of the French, who’d come to reinstate the Pope, which of course was the preamble to the creation of the Italian state some fourteen years later. The book closes with the nine month German occupation of 1943. The author makes a truly enormous effort to not only keep some type of narrative going, but also to revise the history you’ve just learnt and to recount the evolution of his city through time. You can’t really hop around randomly between sieges and sackings, this is a book to be read linearly. Regardless, and perhaps it’s my fault for knowing so little, I’ve got to say I lost him often. There’s quite simply a whole lot of history (and far far far too many names of buildings and monuments) packed in these pages. But I did gain a very good understanding about how the city changed through time, for the evolution of the papacy and its role in the history of Rome and I was introduced to a number of historical figures who stand a decent chance of staying in my memory. If you know Rome, I suspect this is an indispensable book. Importantly, I most genuinely enjoyed reading this. It accompanied me everywhere for about a week! Mathew Kneale is primarily a novelist and he uses his narrative skills to great effect when recounting the story of Rome from the attack on the Capitoline hill by Brennus and his Gauls, famously forestalled by the alarm cries of sacred geese, right up to the Nazi takeover after the flight of Mussolini. Kneale carefully sets the scene for each of his vignettes, picking out the salient details to paint a vivid picture of Roman life before each invasion. I was fascinated to discover, for instance, Mathew Kneale is primarily a novelist and he uses his narrative skills to great effect when recounting the story of Rome from the attack on the Capitoline hill by Brennus and his Gauls, famously forestalled by the alarm cries of sacred geese, right up to the Nazi takeover after the flight of Mussolini. Kneale carefully sets the scene for each of his vignettes, picking out the salient details to paint a vivid picture of Roman life before each invasion. I was fascinated to discover, for instance, that just before the invasion of Aleric, Rome had over three hundred public lavatories. You would be hard put to find one these days. A lot of this is familiar territory – the excesses of popes, the ambition of emperors, the development of the pilgrimage industry, the glamour of Garibaldi – but Kneale knits it all together adroitly, managing to create a coherent picture from the disparate parts. In doing so, he mimics the characteristic qualities of his subject, a city that over time has absorbed and assimilated all those who sought to conquer it and made them part of its complex and fascinating identity. What a delightful reading experience. The Eternal City as it is known has witnessed and withstood a lot in its glorious and not so glorious history. The authors explores the history of major events through the history of major battles and what preceded those events. The precedents are not only military, but historical, cultural, and religious. This is what makes this book so informative. The approach to the narrative structure is also quite original. The author first mentions one of the proverbi What a delightful reading experience. The Eternal City as it is known has witnessed and withstood a lot in its glorious and not so glorious history. The authors explores the history of major events through the history of major battles and what preceded those events. The precedents are not only military, but historical, cultural, and religious. This is what makes this book so informative. The approach to the narrative structure is also quite original. The author first mentions one of the proverbial sackings, and then tells the backstory that explains why and how it was possible. It also adds significant substance and meat to the story, and despite the somewhat original approach to the major story of Rome, the book also flows well and sounds harmonious and coherent. Additionally, I found personal deviations about some of the historical participants quite engaging, and the book is full of those small gems. Plenty here that's of interest and very readable, full of evident enthusiasm. But frustrating as it's one of the worst proofed books I've seen. Articles (definite and indefinite) appear utterly arbitrary, and better editing would have picked up its repetitiveness and some inconsistencies and contradictions (quite often people mostly did x and then mostly did y, which is the opposite). Awkward expression throughout makes it hard to believe this was written by an award-winning novelist. This was a great quick read that gave a whirlwind look at the history of Rome from antiquity to the present day. I loved the set-up; each chapter had a standard formula with who was doing the sack, the state of the city at the time, and then the sack itself and how it changed Rome. I personally think this would be an excellent book to pick up if you're going to Rome and want a little more background on some of the city. Kneale does an excellent job at telling you when some of the greatest monume This was a great quick read that gave a whirlwind look at the history of Rome from antiquity to the present day. 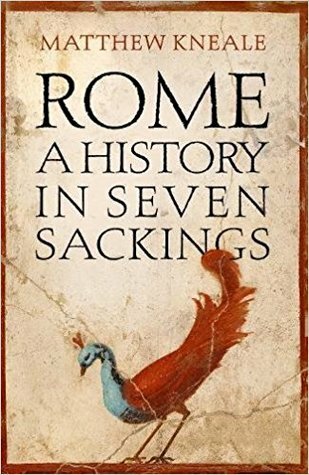 I loved the set-up; each chapter had a standard formula with who was doing the sack, the state of the city at the time, and then the sack itself and how it changed Rome. I personally think this would be an excellent book to pick up if you're going to Rome and want a little more background on some of the city. Kneale does an excellent job at telling you when some of the greatest monuments were built and how they were used across the centuries (believe it or not, the Colosseum was an apartment building in much of the medieval period). How some of the more famous piazzas changed from ancient Roman chariot racing grounds to the popular gathering places they are today was also fascinating. I did not find the Gauls and Visigoths, et al as interesting as I expected. Less detail would have improved the book for me. But of course, if I had known that ahead of time, I would not have chosen the book. What I did find very interesting are the sections of the book covering relatively more recent history, the corrupt popes and Mussolini. I knew a bit about the popes and especially remember when the Catholic Church struck many saints from existence in the 1960's, reporting that not only were I did not find the Gauls and Visigoths, et al as interesting as I expected. Less detail would have improved the book for me. But of course, if I had known that ahead of time, I would not have chosen the book. What I did find very interesting are the sections of the book covering relatively more recent history, the corrupt popes and Mussolini. I knew a bit about the popes and especially remember when the Catholic Church struck many saints from existence in the 1960's, reporting that not only were they not saints but many never existed! It was a shock to me at the time. I didn't know that they were created in a public relations campaign, in which Rome competed with Jerusalem for pilgrims and travelers and money. The final chapter, about the Nazis and Mussolini, was the most interesting and confirmed facts I had learned from other books: that (ironically) more Italian Jews survived the war than the Jews of other European countries and the Italian army did not fight well because they were not invested in the aims of the war. Just couldn't get up the enthusiasm beyond about chapter 2. I didn’t care for the structure of the book. It attempts too much. This book offers a great shorthand history of Rome. Written in an anecdotal and narrative style it is not dry. And if you like architecture, this will not disappoint. A book I read like it was a novel. An interesting group of articles about the different sacks of Rome that is a history book and a telling of the city history. Honestly, I expected Rome: A History in Seven Sackings to be a much better book. It's a good book. It's got lots of interesting stuff within its covers. It's reasonable well-written. The problem, for me, is that I didn't learn a whole lot. I'm no Rome scholar, but nearly everything seemed like a refresher on stuff I'd already stuffed into my head. The only one of the seven sackings I didn't know much about came in the mid-1800s when Mazzini and Garibaldi were on the scene, a time and place that's Honestly, I expected Rome: A History in Seven Sackings to be a much better book. It's a good book. It's got lots of interesting stuff within its covers. It's reasonable well-written. The problem, for me, is that I didn't learn a whole lot. I'm no Rome scholar, but nearly everything seemed like a refresher on stuff I'd already stuffed into my head. The only one of the seven sackings I didn't know much about came in the mid-1800s when Mazzini and Garibaldi were on the scene, a time and place that's never penetrated my thick skull somehow. The rest, though, I knew. Almost all of it. Still, the book is interesting. It makes me wants to explore Rome, something I've never yet had the chance to do. It's obviously something I should. "Враговете никога не бяха успели да превземат Анкх-Морпорк. Е, в известен смисъл успяваха, при това твърде често. Градът посрещаше волните варварски нашественици, но озадачените нападатели някак си винаги откриваха след няколко дена, че вече не притежават собствените си коне, а след няколко месеца бяха просто още едно малцинство със свои собствени драсканици по стените и магазини за хранителни стоки." С "Rome: A History In Seven Sackings" Матю Нийл (автор на прекрасната "Англ "Враговете никога не бяха успели да превземат Анкх-Морпорк. Е, в известен смисъл успяваха, при това твърде често. Градът посрещаше волните варварски нашественици, но озадачените нападатели някак си винаги откриваха след няколко дена, че вече не притежават собствените си коне, а след няколко месеца бяха просто още едно малцинство със свои собствени драсканици по стените и магазини за хранителни стоки." С "Rome: A History In Seven Sackings" Матю Нийл (автор на прекрасната "Английски пасажери") засвидетелства своята любов към града, който го приютява вече 15 години. Нийл не се спира само на военната окупация през съответната година, а връщайки се десетилетия и векове назад, описва по интересен и достъпен начин, що за хора са били и жителите на Рим, и нашествениците. A very enjoyable read, beyond Ancient Rome I have had little to no interest in the history of the Eternal City. This book has however piqued my interest especially in the history of Rome up to and around the Renaissance, it brings to life many memorable events and characters and one can imagine the treachery and danger of being a Roman across all centuries. Easily readable and relatable, not a hard book or a chore to get through. What slowed me down was my unfamiliarity with Roman and to a degre A very enjoyable read, beyond Ancient Rome I have had little to no interest in the history of the Eternal City. This book has however piqued my interest especially in the history of Rome up to and around the Renaissance, it brings to life many memorable events and characters and one can imagine the treachery and danger of being a Roman across all centuries. Easily readable and relatable, not a hard book or a chore to get through. What slowed me down was my unfamiliarity with Roman and to a degree Italian history beyond the Roman Empire, which I am now happy about because I now have new interests to explore and research such as Robert Guiscard and the Normans. It's not very often that I read a review of a book and then realize that it's in my pile of books to read - but this happened here. For a change, I slightly disagree with the published review. I thought this was quite a good way to write about a city with so much history, but I do wonder if there were others the author could have used. I received this book as a Christmas present, but it sat on my shelf for a few months before I plucked up the courage to read it. I was almost afraid of what I would find. Given my deep interest in, and veneration of, classical civilisation, I didn’t want to hear about the destruction of the eternal city by some greasy Gauls, lousy Ostrogoths, or pillaging Spaniards. I preferred to ignore this sad decline and wanted to revel in Rome’s classical grandeur. I winced at the thought of ancient marble I received this book as a Christmas present, but it sat on my shelf for a few months before I plucked up the courage to read it. I was almost afraid of what I would find. Given my deep interest in, and veneration of, classical civilisation, I didn’t want to hear about the destruction of the eternal city by some greasy Gauls, lousy Ostrogoths, or pillaging Spaniards. I preferred to ignore this sad decline and wanted to revel in Rome’s classical grandeur. I winced at the thought of ancient marble masterpieces being smashed and incinerated to make lime mortar, or the blood-hallowed stones of the colosseum, the most concentrated killing ground in history, being pillaged for St Peters. Give me conquering Caesar in his triumphal procession. But this, I admit, is a rather silly, narrow-minded view of a city that has a much richer, and longer, history. Rome is a city that has been birthed again and again; its countless metamorphoses took it from backwater Latin town to epicentre of the word’s greatest empire, then to the seat of its greatest religion, and finally to modern capital of a unified Italy. It was disaster just as much as triumph that has shaped Rome’s cultural fabric. Fortunately, much of Rome’s history lingers on in its surviving buildings – churches, temples, forums, piazzas, and palaces. These relics offer a snapshot of each of Rome’s successive ages. History built atop history. Kneale, a resident for over 15 years, uses his intimate knowledge of Roman geography to great advantage. Through his detailed description of events, and augmented by excellent maps at the beginning of each chapter, history becomes geographically navigable in the mind. There is something captivating about Rome. The mind reels at a “dizzying sense of time past and greatness lost”. By looking at seven major invasions between 387 BC and 1944 AD (Gauls, Goths, More Goths, Normans, Spanish and Lutherans, French, Nazis), Kneale is able to unpick Rome’s winding ways and separate the historical strata layer by layer. Rome is a great survivor; like some hardy bacterial colony, it has endured massive population collapse, from a bustling classical metropolis of over a million inhabitants, to a town of just a few ten thousands under Pope Gregory VII where the ancient forum was known as the ‘Campo Vaccino’ or cow-field. Each sacking served as a major turning point in the life of the city, and Kneale offers fascinating insights into Rome’s various incarnations. He travels previous Roman generations forward to each subsequent period and dissects what they would find reassuringly familiar, or disconcertingly different. This helps to give a vivid sense of Rome as an expanding, contracting, evolving, surviving, organism. The book’s structure is formulaic but effective; each of the seven chapters is a tripartite chronicle of a particular invasion. The narrative begins with premonitions of doom, as the invading army is described and the historical backdrop fleshed out. Next, life inside the city walls is examined; some inhabitants are proudly defiant, others festering in fear, while some are plotting betrayal (all sieges but one succeeded only with the complicity of insiders). The chapter ends with a fall as the sack itself is played out – citizens murdered, damage wrought. Each chapter is split into three parts for each sacking: context, daily life, the sacking itself. My main bone to pick is that the context parts are mostly international politics and often largely irrelevant to the sacking itself. This book promises Rome and sackings; a third of this book then fails at delivering its promise. That said, I loved the details about daily life in Rome in each period. From the hill made of pot-shards (Roman equivalent of disposable Tupperware) to the development of f Each chapter is split into three parts for each sacking: context, daily life, the sacking itself. My main bone to pick is that the context parts are mostly international politics and often largely irrelevant to the sacking itself. This book promises Rome and sackings; a third of this book then fails at delivering its promise. That said, I loved the details about daily life in Rome in each period. From the hill made of pot-shards (Roman equivalent of disposable Tupperware) to the development of food culture from curry-analogs to pasta. The sackings up to and including the modern times are interesting, a mix of hearsay, slander and true archeological snapshots. They begin to feel repetitive up until post-medieval sackings, which goes to illustrate that Rome didn't have much in the way of weaknesses other than reliance on food imports. The trouble with a history of Rome is how much detail to put in it. Take a story that spans more than two millennia and that task simply grows. I really like the premise of this book - focus on the biggest upheavals of the city and frame them against roman life at each time point. What you get is a glimpse into how roman people have lived and strived through the ages. My favourite glimpses of the city were the ancient hints in the first chapter and the later contrasts of the 19th and 20th centurie The trouble with a history of Rome is how much detail to put in it. Take a story that spans more than two millennia and that task simply grows. What you get is a glimpse into how roman people have lived and strived through the ages. My favourite glimpses of the city were the ancient hints in the first chapter and the later contrasts of the 19th and 20th centuries. The fall of emperors, rise of popes and ebbing and flowing population groups are all held within a great story. Surprisingly for me, the medieval chapters were less interesting and slowed things down a little for me. Well worth a read whether you have visited the history of Rome before or not. As a novice in Roman history, I found this book to be a great initiation into this genre. Right from the 400s BC to the 20th century world wars, the book chronicles the seven major sackings that Rome and its inhabitants have faced. Curated with banal to highly important pieces of information, the book makes for an interesting read. Towards the end of the book you would have successfully placed the Roman governmental structures over the years, especially the transition from a merit based Emperor As a novice in Roman history, I found this book to be a great initiation into this genre. Right from the 400s BC to the 20th century world wars, the book chronicles the seven major sackings that Rome and its inhabitants have faced. Curated with banal to highly important pieces of information, the book makes for an interesting read. Towards the end of the book you would have successfully placed the Roman governmental structures over the years, especially the transition from a merit based Emperor style rule to a shadow theocracy, and later a fascist regime. You would learn a great deal about Roman Architecture, and about the geographical extent of the Roman Empire. - The Goths weren't as barbaric as I thought they were. - Those Popes were up to no good, were they? - History's trajectory of violence seems exponential. No random thought though, this: Sackings 1-6 made fox 3-star reading, at best. But the chapter that took up one third of the book's pages, that last sacking by the Nazis, and the events prior, which included a primer on Il Duce, was definitely 5 stars. 5 stars for the invaluable history lesson learned from it, and the layers of inhumanity and humanity, revealed at wartime. A relief to realize that humanity trumped evil. Kneale is the son of writers Nigel Kneale and Judith Kerr, and the grandson of essayist and theatre critic Alfred Kerr.